Jair Bolsonaro is projected to win the presidency of Brazil in a runoff election on Sunday. His controversial policies on the environment and Indigenous rights will pose a challenge for a Trudeau government that sees those issues as key planks in its foreign policy. He's said things that might make Philippine President Rodrigo Duterte blush and survived a stabbing that almost took his life. Now, Jair Bolsonaro is expected to win a powerful mandate Sunday to become president of Brazil, the world's fifth-biggest country. Bolsonaro is Brazil's answer to Donald Trump, a man who outrages progressive Brazilians with his insults directed at women, gays, black people and Indigenous people, but whose coarse and violent rhetoric has struck a tone with an angry section of the electorate. Bolsonaro has sworn to scrap environmental laws, throw the Amazon open to ranchers and miners and confiscate the lands of Brazil's indigenous people. "It's shocking in this day and age," said Clem Chartier, president of Canada's Métis National Council. "I've never seen anything more atrocious than the comments that are being made now. Hopefully they don't actually follow through on the threat to assault Indigenous peoples and lands in such a way." If Bolsonaro does follow through on even some of his promises — his pledge to pull Brazil out of the Paris Accord on climate change, for example — his presidency will present the Trudeau government with a daunting challenge on the international stage, said Jean Daudelin, who specializes in Latin American affairs at Carleton's Norman Paterson School of International Affairs. "His rhetoric has been both extreme and alarming. It's alarming because it is, to a large extent, credible, because he has long-standing positions against Indigenous reserves, against the restrictions on the expansion of agriculture in the Amazon, and because he's likely to have substantial support in Congress for that agenda." And under Brazil's constitution, said Daudelin, there's little the courts can do to stop Bolsonaro if he has the votes in Congress. Bolsonaro's policies on Indigenous people are driven largely by his supporters in Brazil's powerful cattle-ranching and soybean industries. The Bolsonaro campaign plank that has most swayed ordinary voters, however, is his promise to get tough on criminals. Bolsonaro says he will give police "carte blanche to kill" (Brazilian police already kill an average of 14 people per day) and will loosen Brazil's restrictive gun laws. 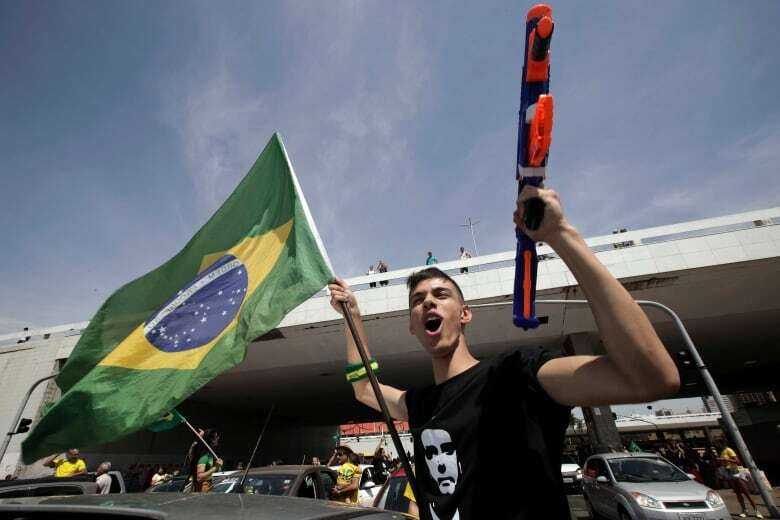 Brazilians saw 63,880 murders last year — more than any other country in the world. The per capita murder rate is higher than it was before 2003, when socialist President "Lula" da Silva enacted the 'disarmament statute', making it difficult for ordinary Brazilians to acquire firearms. Many of those who intend to vote for Bolsonaro express reservations about his controversial statements but are exasperated with violent crime. 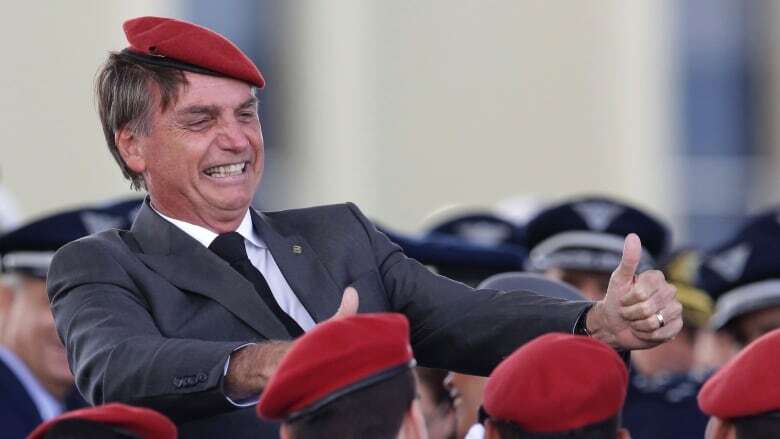 Bolsonaro himself spent much of the last seven weeks of his campaign out of sight after being seriously injured by a knife-wielding assailant in Minas Gerais and losing 40 per cent of his blood. The man who stabbed him was a supporter of his socialist opponent with a history of mental problems, but if he was hoping to end Bolsonaro's run for the presidency, he failed. The candidate's thumbs-up photos from his hospital bed only increased his popularity. Bolsonaro's trademark gesture is to hold both hands as if pointing a rifle, and he's pledged to pass new laws allowing any Brazilian with a clean record to buy up to six guns, and to carry firearms in public. But Bolsonaro's critics have accused the law-and-order candidate of holding an ambivalent attitude toward the rules of Brazil's constitution and democracy. He's reminisced repeatedly about the military dictatorship that ruled Brazil from 1964 to 1985, saying its worst mistake was that it tortured its political opponents rather than killing them, like its counterpart in Argentina. His vice-presidential running mate (also a former Army officer) has openly speculated about the option of a military takeover during Bolsonaro's mandate. And his son Eduardo, also a congressman, said over the weekend that it would be easy for the military to close Brazil's Supreme Court if it sought to interfere with his father's presidency. "All it takes to shut the Supreme Court is one corporal and one private," said Eduardo in remarks his father first denied he had made, and then (once it became clear there was video) said had been taken out of context. Though Bolsonaro failed to win a majority in the first round of voting, Brazil's electoral system forces voters to choose between only two candidates in the second round. Bolsonaro was an obscure member of Congress prior to Operation Car Wash, a corruption investigation that began in 2014 and grew to ensnare some of the biggest names in Brazilian politics and business, trashing the reputation of established parties and causing the public mood to turn increasingly angry. 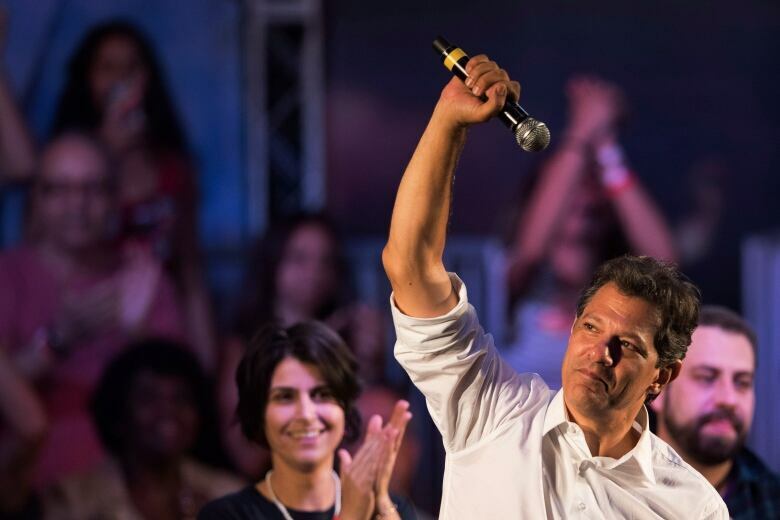 His opponent is Fernando Haddad of the Workers' Party, suspected by many Brazilians of being a puppet who receives direction from the jail cell where former President "Lula" da Silva is serving time for taking bribes. Anger at the Workers' Party is still running high in Brazil; about 59 per cent of Brazilians tell pollsters they plan to vote for Bolsonaro. "It's your choice," Bolsonaro recently tweeted. "Be governed by someone clean, or by the puppet of a person who's in prison for corruption!" Bolsonaro's campaign has received advice from former Trump campaign manager Steve Bannon. Eduardo Bolsonaro said in a tweet that Bannon and his family are "in touch to join forces, certainly against cultural marxism." The man some supporters call "our captain" has also received heavy support from Brazil's powerful evangelical churches, which have lent an energy to his campaign that Brazil's traditional right-wing parties have often lacked. Bolsonaro's slogan and campaign song — "Brazil above everything, God over everyone" — is sometimes performed by his evangelical supporters in highly choreographed street dance routines and rallies. For the Trudeau government — which has pledged to enshrine the UN Declaration on the Rights of Indigenous Peoples into Canadian law, and which has made reconciliation with Indigenous peoples a central plank of its program — Bolsonaro's plans for Brazil's native peoples will make it hard to remain silent. Brazil has 720 indigenous reserves, ranging in size from a single hectare to nearly ten million hectares. Bolsonaro has said he wants to put all of those lands — 13 per cent of Brazil's territory — on the auction block. "Minorities have to adapt to the majority," he said, "or simply disappear." He said that under a Bolsonaro administration, "not one square centimetre" of Brazil will be reserved for the country's original inhabitants. "I'm afraid that in the remote areas, Indigenous peoples will be caught up in this," said Chartier, who this April joined with South and North American Indigenous leaders to create a new American Council of Indigenous Peoples. "Their lands are always under threat of attack and encroachment by non-Indigenous people, and if you have a government that's willing to perpetrate that, I think you'll see widespread destruction both of human life and property." More troubling is the question of what might happen to the estimated 60 "uncontacted" bands living deep in the Amazon rainforest. Brazil has more uncontacted tribes than any other country on Earth, and they are typically protected by reserves established by FUNAI, Brazil's agency for Indigenous affairs. "Canada needs to step up and make sure its voice is heard loud and clear," said Chartier. "FUNAI is trying to isolate and protect those people to the degree possible. If those areas are just thrown open, that's going to be devastating to their way of life, to their health, to their culture." "I can imagine Canada taking a fairly strong stance on this," said Daudelin, who doubts the courts will be able to protect Indigenous Brazilians from a Bolsonaro government. But Daudelin said the arrival of Bolsonaro also presents a temptation for Canada, which has been in free trade talks with Mercosur, the South American common market dominated by Brazil. Mercosur's main members now all have business-friendly governments. "Brazil and Mercosur, that's more than 50 per cent of the GDP of South America. So there will be a tension there," he said. "It depends how the violations of Indigenous rights can be traced to government action. If it's inaction, the government can probably get away with it. It may be difficult for Canada to criticize the government on that basis. It really depends on how aggressively the development agenda of Bolsonaro ends up being implemented." And if Canada does complain? "I think Bolsonaro will basically brush that aside."